On a recent Friday morning, Franklin High senior Karla Santos was mostly looking forward to the big game that night with rival Stagg High School. 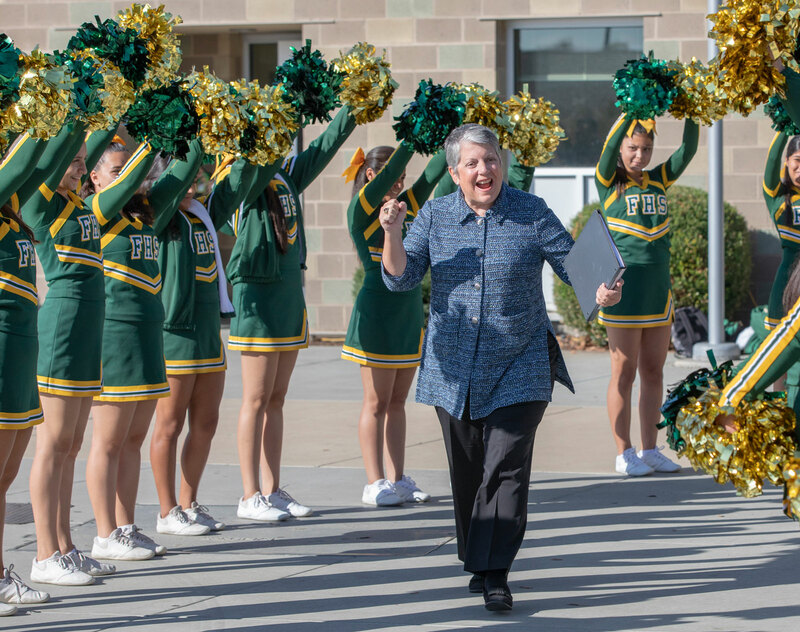 But after hearing from UC President Janet Napolitano at a rally to encourage students to strive for college, she was brimming with excitement for what lay beyond. “Now I believe, yes, I can go to college!” said Santos, an honor student and track athlete who is hoping to study science and medicine. Coming from a low-income family, however, Sanchez had worried about how she could afford higher education. That is just the message Napolitano hoped to offer on October 5 when she joined Stockton community leaders to speak to 500 college-track juniors and seniors and encourage them to set their sights on higher education. Napolitano receives a warm welcome from the cheer squad of Franklin High. The Franklin High pep squad and marching band were on hand to cheer the arrival of UC and civic leaders, who had come to instill the message that Franklin students are college — and UC — material. Nearly 90 percent of students there are from low-income households and are underrepresented minorities. 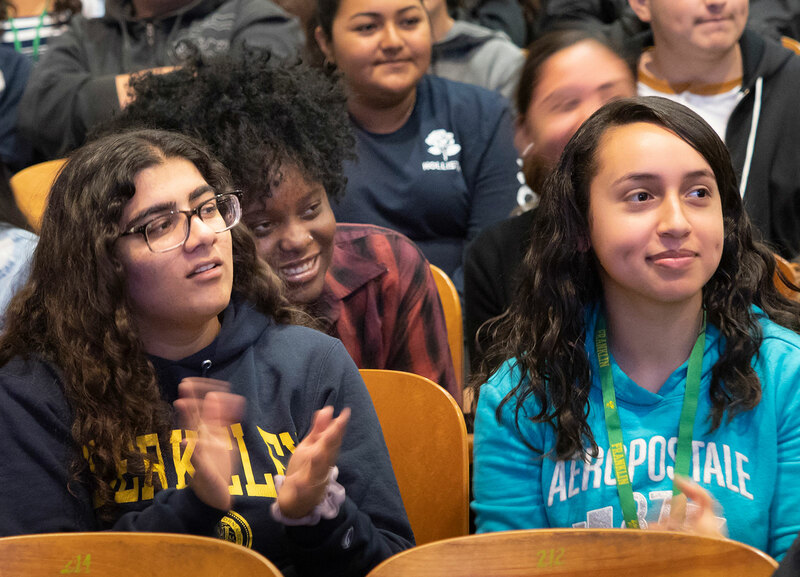 Napolitano stressed the many ways that the university is committed to helping Franklin High students attain a world-class UC education, including through need-based financial aid. 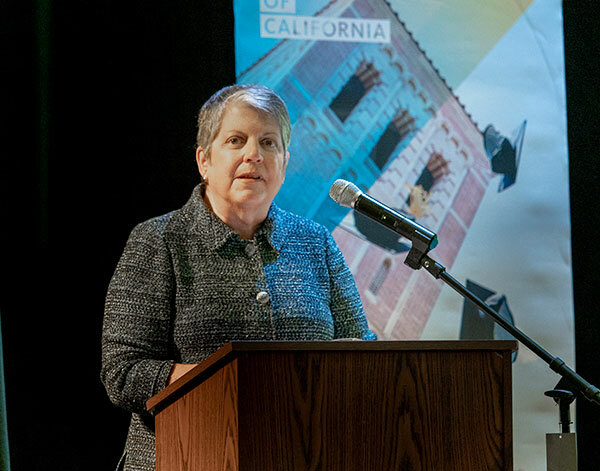 Nearly 60 percent of UC’s California students have the full cost of their tuition covered by aid, Napolitano said. Earlier in the morning, she met with about 50 eighth-graders who are part of the International Baccalaureate Middle Years Programme, a rigorous college-prep program for high-achieving middle school students. Students in the International Baccalaureate program hear about how to get an early start in preparing for college. Stockton, one of California’s poorest cities, was especially hard hit by the 2008 recession. But city leaders have set their sights on nothing short of a renaissance, part of which includes an ambitious new effort to increase the number of college graduates who call Stockton home. Through the Stockton Scholars program, the city has pledged to provide $1,000 a year in funding for college to every student who graduates high school with at least a C average. UC is pitching in, too. 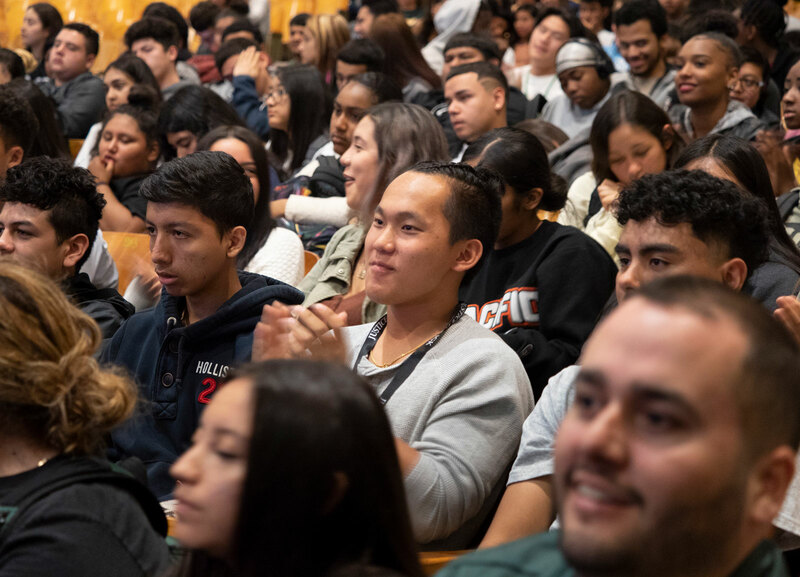 Napolitano announced during the Stockton visit that UC will expand its popular Transcript Evaluation Service to all 10,000 high school students in the Stockton Unified School District. The service helps students stay on track for college by providing personalized reports that show students exactly which courses they’ve completed and which still need to be taken in order to be eligible to enroll at a CSU or UC campus. 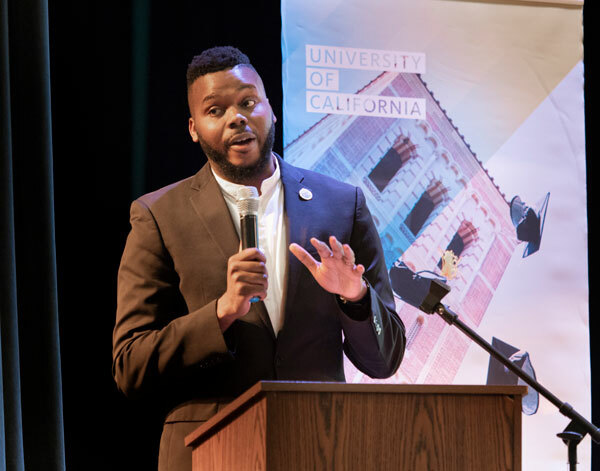 Stockton Mayor Michael Tubbs, left, and University of California President Janet Napolitano address college-track students at Franklin High in Stockton, Calif. on October 5, 2018. 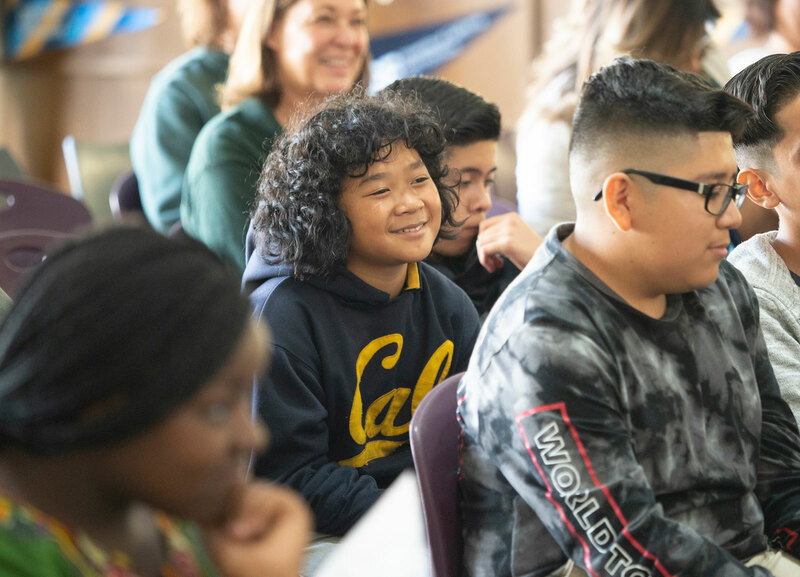 Joining Napolitano in urging students to aim high were a host of local dignitaries, including U.S. Rep. Jerry McNerney and California Assemblymember Susan Talamantes Eggman. Stockton Mayor Michael Tubbs was given an especially warm welcome as a 2008 graduate of Franklin High. “When I was working hard to get to college, I had no idea that 10 years later, I would be mayor of Stockton. But I knew education was my way out,” Tubbs said. His mom was just 16 years old when she had him, Tubbs said, and his father was incarcerated. He recalled having to take long bus rides to get places and the other struggles that come with being poor. “Some of you have to do homework while hungry. Some of you have to do it while taking care of siblings. It’s not easy and it’s not fair, but I want to tell you it’s worth it,” Tubbs said. Franklin High School students hear from civic and UC leaders on how they can achieve UC. Students need to hear that powerful message because so many of them don’t see themselves as college material, said Stockton Unified School District Principal Juan Salas. Their families didn’t go to college and students believe it’s out of reach. “This helps shift the culture, said Salas, a UC Riverside graduate who was a first-generation college student himself. Students get amped for college. Alexa Obeso was especially moved by hearing about the support UC offers for undocumented students, including dedicated student centers and free legal assistance. The oldest child and the only one who is undocumented, Obeso wants to set an example for her siblings. She also wants to financially support her father, who wakes up every day at 3 a.m. to go to a job at a meatpacking plant. An honor student and a cheerleader who is active in community service, Obeso has dreamed of going to college since she was little. 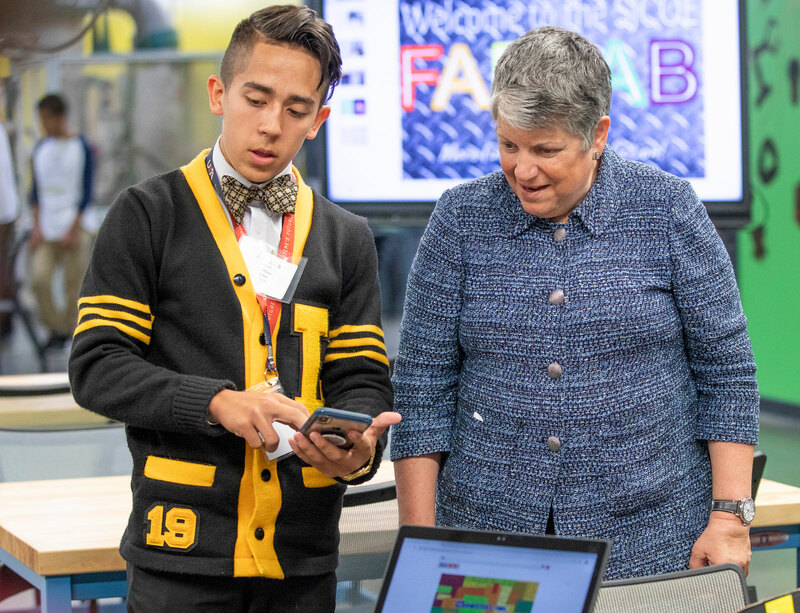 Following the school rally, Napolitano toured the county’s recently opened FabLab, a high-tech science and maker space that was created to provide access to technology like 3-D computers, laser cutters and 3-D printers to San Joaquin Valley K-12 students. Napolitano visits Stockton's FabLab and sees the work of a Lathrop High student. Students from the entire district can use the FabLab to tackle ambitious science and engineering projects. Napolitano encouraged the students there to see themselves as future researchers, inventors and engineers. Napolitano also urged them to picture themselves on a UC campus. Sierra High School student Dylan Fonseca was excited to learn about the breadth of UC undergraduate research opportunities and entrepreneurship accelerators. He plans to apply to UC Berkeley and UC Merced. Fonseca showed off a smart irrigation system he’d built using duct tape, wires, and a sensor he had programmed himself.